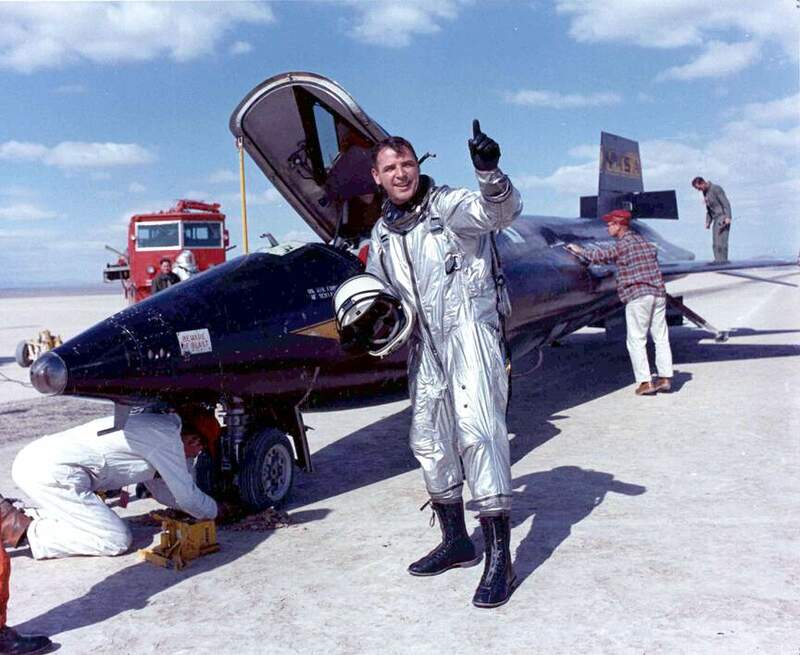 9 November 1961: Major Robert M. White, U.S. Air Force, became the first pilot to fly faster than Mach 6 when he flew the number two North American Aviation X-15 hypersonic research rocketplane, 56-6671, to Mach 6.04. 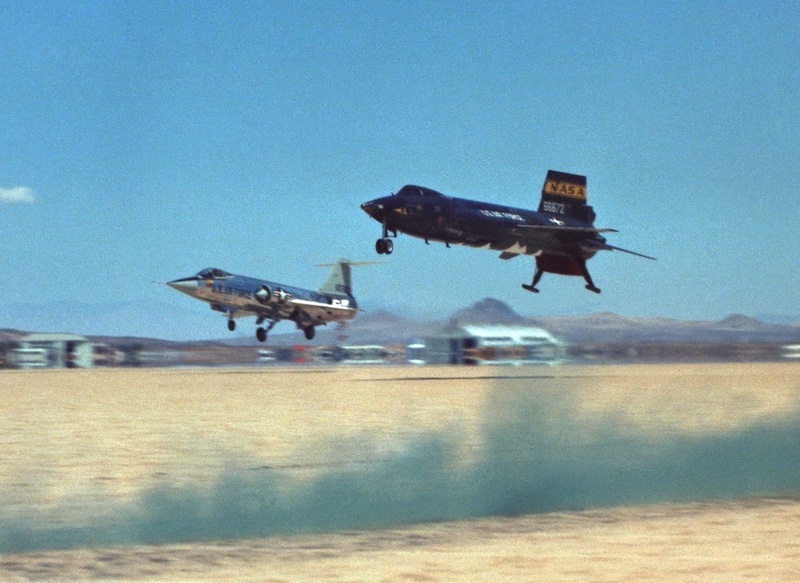 This was the 45th flight of the X-15 program, and Bob White’s 11th flight. The purpose of this test flight was to accelerate 56-6671 to its maximum velocity, to gather data about aerodynamic heating at hypersonic speeds, and to evaluate the rocketplane’s stability and handling. 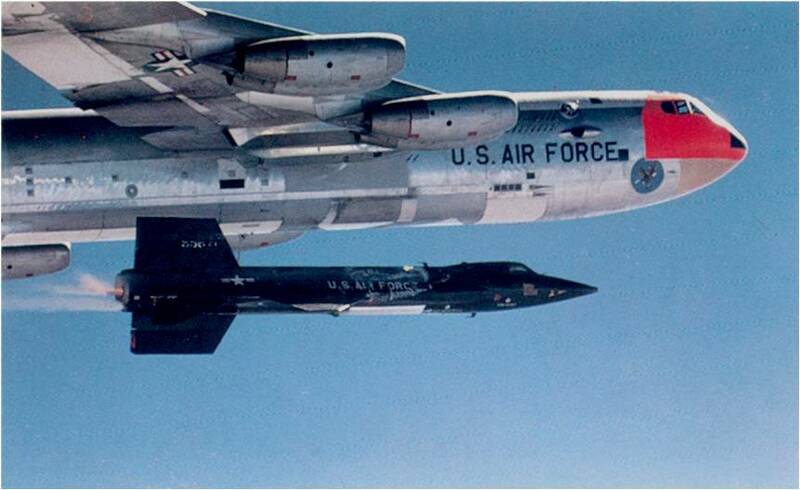 The X-15 was carried to approximately 45,000 feet (13,716 meters) while mounted to a pylon under the right wing of the “mothership,” a Boeing NB-52B Stratofortress, 52-008, nicknamed Balls 8. White was dropped over Mud Lake, Nevada, approximately 200 miles (322 kilometers) north of Edwards Air Force Base. Once clear of the B-52, he ignited the Reaction Motors XLR99-RM-1 rocket engine, and with it producing 57,000 pounds of thrust (253.549 kilonewtons) at full throttle, the X-15 accelerated for 86.9 seconds. The rocketplane reached a peak altitude of 101,600 feet (30,968 meters). Its speed was Mach 6.04 (4,094 miles per hour/6,589 kilometers per hour). 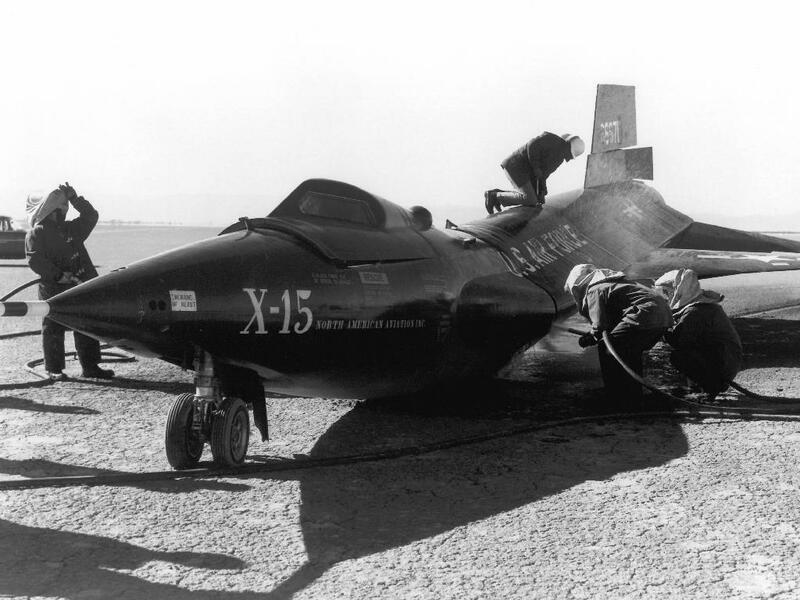 — The X-15 Rocket Plane: Flying the First Wings into Space, by Michelle Evans, University of Nebraska Press, Lincoln and London, 2013, Chapter 3 at Page 87. — At the Edge of Space: The X-15 Flight Program, by Milton O. Thompson, Smithsonian Institution Press, Washington, 1992, at Page 98. 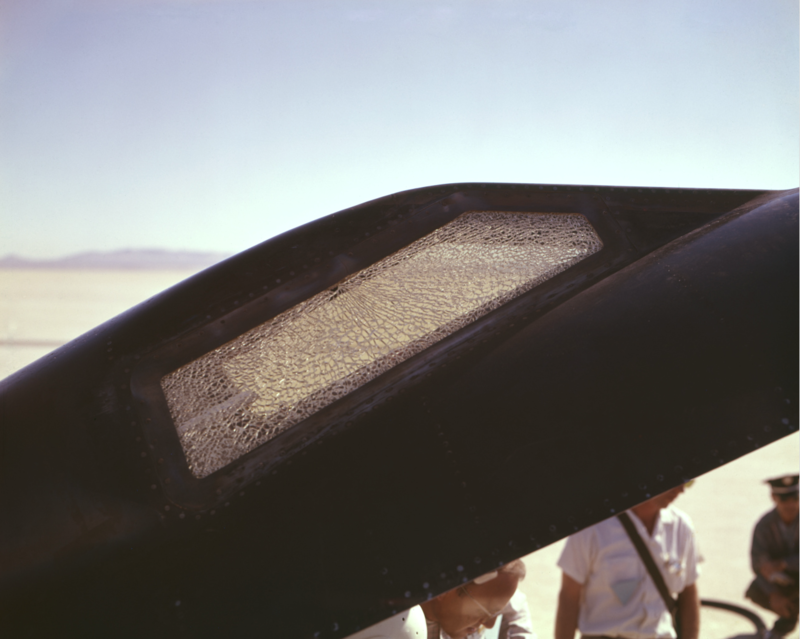 As the X-15 decelerated through Mach 2.4, the right side windshield shattered, leaving it completely opaque. On Bob White’s previous flight, the left windshield had also broken. Fortunately, in both cases, only the outer layer of the dual pane glass broke. 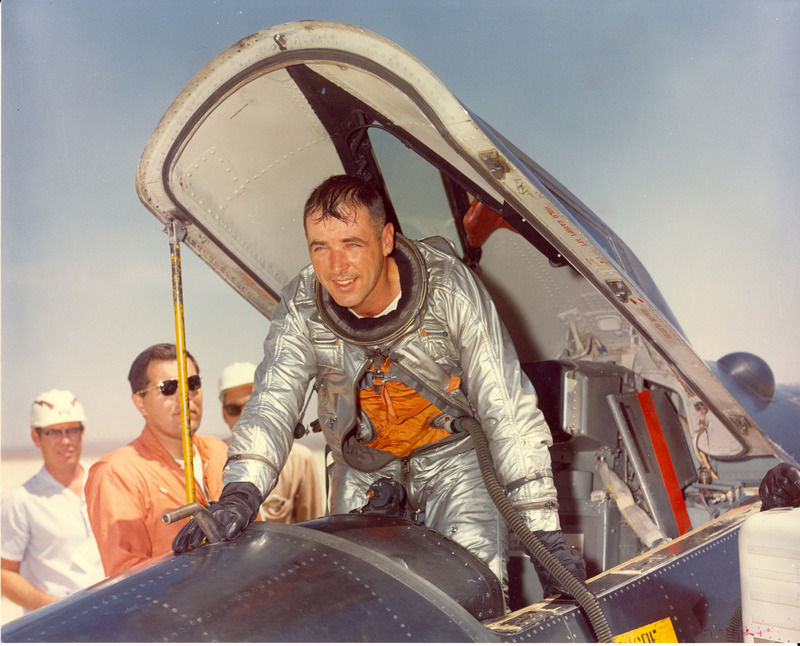 The reduced visibility made the approach difficult to judge, but White made a successful landing, touching down on Rogers Dry Lake after a flight of 9 minutes, 31.2 seconds duration. A P-51 Mustang fighter pilot in World War II, Robert M. White was shot down on his 52nd combat mission in February 1945 and captured. He was held as a prisoner of war until the war in Europe came to an end in April 1945. White was recalled to active duty during the Korean War. 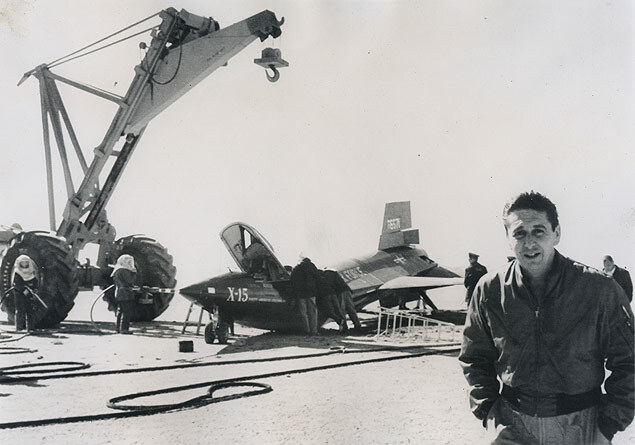 He was a graduate of the Air Force Experimental Test Pilot School and flew tests of many aircraft at Edwards before entering the X-15 program. Major White had been the first pilot to fly faster than Mach 4, Mach 5 and Mach 6. He was the first to fly over 200,000 feet, then over 300,000 feet. He made at total of sixteen X-15 flights. 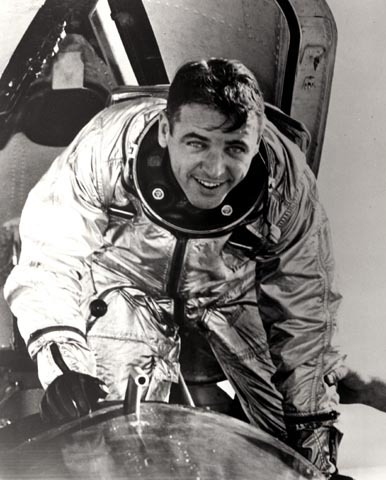 After leaving the X-15 program, Bob White returned to operational duties. Later, he flew 70 combat missions over North Vietnam in the Republic F-105 Thunderchief supersonic fighter bomber, including leading the attack against the Paul Doumer Bridge at Hanoi, 11 August 1967, for which he was awarded the Air Force Cross. He next went to Wright-Patterson AFB where he was director of the F-15 Eagle systems program. He returned to Edwards AFB as commander of the Air Force Flight Test Center. White was promoted to Major General in 1975. 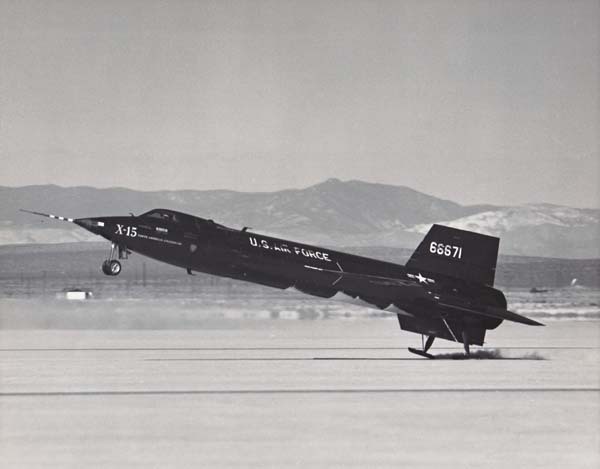 12 August 1960: At Edwards Air Force Base, California, Major Robert M. White flew the North American Aviation X-15 rocketplane to an altitude of 136,500 feet (41,605 meters), exceeding the previous unofficial record of 126,200 feet (38,466 meters) set by the late Captain Iven C. Kincheloe, Jr., with the Bell X-2, 7 September 1956. Iven Kincheloe had been assigned as the Air Force’s project pilot for the X-15. When he was killed on a routine flight, Bob White was designated to replace him. This was White’s fourth flight in an X-15, and the 19th flight of the X-15 Program. 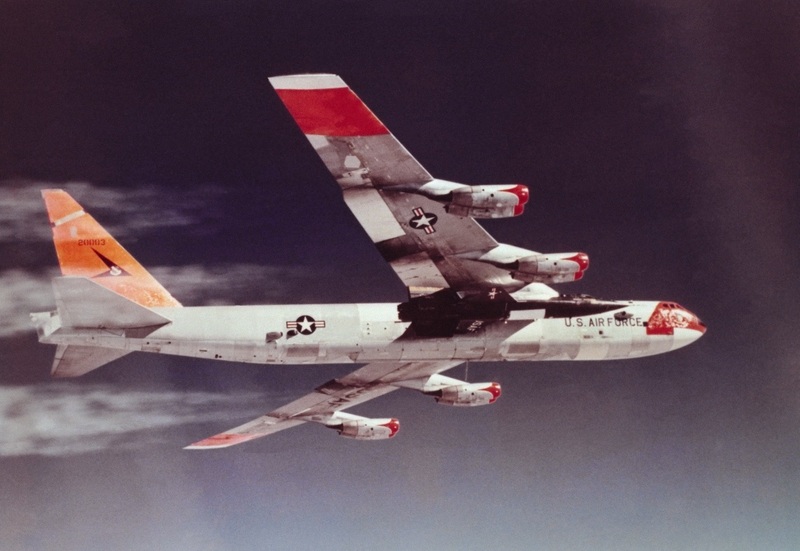 The Number 1 rocketplane, serial number 56-6670, was carried aloft under the right wing of the “mothership,” Boeing NB-52A Stratofortress 52-003. At 08:48:43.0 a.m., PDT, 56-6670 was dropped over Silver Lake, near the Nevada-California border. White fired the two Reaction Motors XLR11-RM-13 rocket engines and they burned for 256.2 seconds. 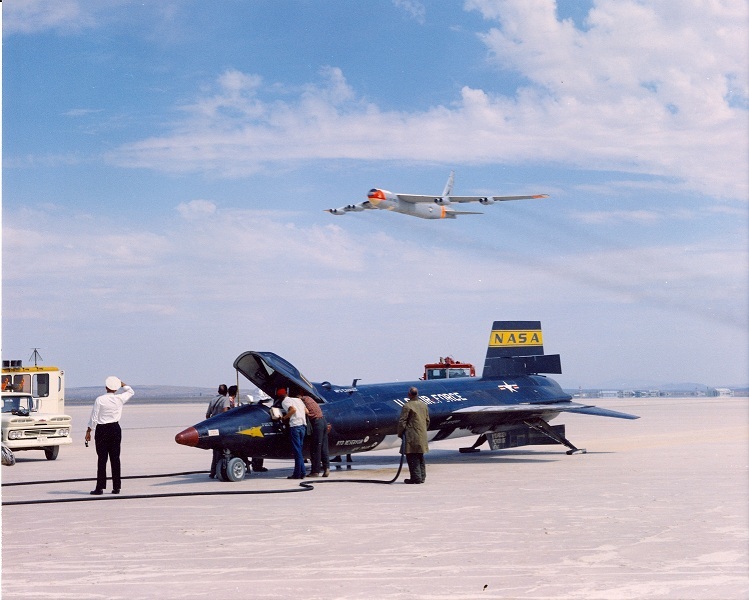 This flight took place in Phase II of the Program and was intended to gradually increase the envelope of X-15 performance with the XLR11 engines while waiting for the much more powerful XLR99. The purpose of Flight 19 was to reach maximum altitude in order to test the rocketplane’s stability and controllability above the atmosphere. 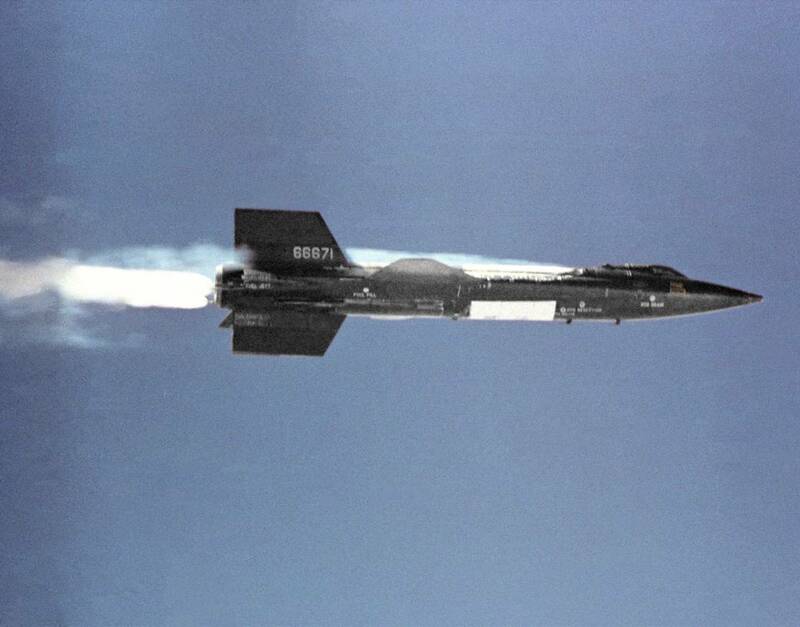 The X-15 accelerated to Mach 2.52, 1,773 miles per hour (2,853 kilometers per hour) while climbing at nearly a 70° angle and reached a peak altitude of 136,500 feet (41,605 meters). 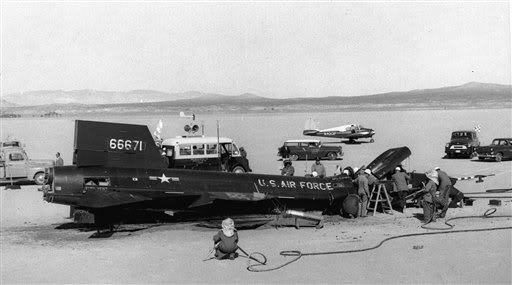 After engine shutdown, White glided to a landing on Rogers Dry Lake and touched down. The duration of the flight was 11 minutes, 39.1 seconds. Neither Kincheloe’s or White’s altitudes are recognized as records by the Fédération Aéronautique Internationale(FAI). Over the next few years, the X-15 would reach to nearly three times higher.